Reviews: Yamaha Reface Series, Sontronics Aria, Dave Smith Instruments Sequential Prophet 6, Behringer XR18, Novation Launchpad Pro, Barefoot MM45, Audient iD14. Techniques: Windows 10 For Musicians, Why Only Subwoofers Can Produce Accurate Low End. Features: Recreating The 1980s Home Studio Experience (Cover), Inside Track: Bring Me The Horizon, Jean-Michel Jarre Interview. Plus: Vote Now In The SOS Awards. This month: Noise Co Patterning drum machine app and the Korg iM1 synth app, both for iPad. Less than a year after refreshing their eight-channel preamp design, Audient have released another. What makes this one different? Audient’s new interface aims to keep the quality of its predecessor whilst streamlining the features and cutting the price. Although not as well-known as the classic Fairchild 660, the Telefunken U73b is in many ways its European counterpart. Barefoot’s newest monitor may be their most affordable to date, but the company’s meticulous design ethos is evident throughout. The stagebox/mixer format has become hugely popular of late. Does Behringer’s affordable take on the concept deliver the goods? With so much choice on offer, picking the right brass library for your music can be tricky. Our comprehensive product guide shines a spotlight on the current contenders. The soundware label of James Wiltshire of the Freemasons, F9 Audio are promising a new range of soundware called Drumtrax. Malvern’s annual West Fest event proved an ideal opportunity to put Fohhn’s newest compact line-array PA speakers to the test. Les Paul was truly one of the pioneers of recording technology. Do Gibson’s first ever monitors live up to his illustrious name? The Forte offers stage-piano immediacy combined with the deeply programmable synthesis that we’ve come to expect from Kurzweil. This Polish company’s debut product, an inductor EQ, could be just the thing to apply a little professional polish to your recordings. Most handheld mics are of the cardioid variety, but as this model proves, a moving-coil design needn’t be directional to be good. Billed as ‘The Jazzy Film Scoring Library’, Swing focuses on the Big Band sound. Read more about Project SAM Swing! Presented as a three-knob pedal complete with footswitch, the 615 Smooth is designed to work with both instrument and studio outboard setups. Portability and versatility inevitably mean trade-offs. Have Roland got the balance right? Sample Magic have been making sample libraries for many years, but this virtual drum machine and synthesizer combination is their first instrument. SE Electronics’ Reflexion Filters are well established items of studio kit, but the company continue to refine the concept and now offer several variations, the latest model being the GuitaRF. Siren Audio launched the Lorelei suite of applications a few years ago but now two of them, Generative and Feedback 2 have received major tweaks and updates. Sonokinetic’s vigorous orchestral phrase library piles on the cinematic drama in 4/4 time. For their latest model, Sontronics set out to create a future classic. Have they achieved it? What exactly is a harp guitar? It’s a new one on me, but its history and background is intriguing. If your loops lack flavour, Sugar Bytes’ innovative slicing plug–in might be just the special sauce they need! This SSL-inspired compressor boasts excellent performance and some useful additional functions. What’s not to like? It’s easy to pigeonhole spring reverbs as guitar amp accessories, but back in the pre-digital era, AKG built a no-holds studio spring reverb system called the BX20. Cobalt Saphira is the first of Waves’ new Cobalt series of plug-ins. It’s an enhancer effect, but one which goes way beyond conventional harmonic enhancers. Yamaha’s Reface range recreates four of their classic instruments in miniature form. Combining dynamics processing with Logic Pro X’s reverbs and other plug-ins can produce some very creative ducking effects. Greg Price has spent nearly 20 years at front of house for some of the biggest names in rock, and now his company believe they’ve perfected the art of live recordings. The latest native Pro Tools versions offer powerful features that were once restricted to HD systems. This page contains a directory of all media pages that hold the associated media for November 2015. How Do You Develop A Mix Strategy? The Travis Waltons: How do you develop a mix strategy for a song when you don’t understand what the artist intends? Unlike most DAWs, Reaper can be run from an external drive without leaving a trace on the host machine! Three things stand out about 1985: Mario and Luigi took the world by storm, Back To The Future hit cinemas for the first time, and Sound On Sound celebrated its inaugural issue. To celebrate the magazine’s 30th birthday, the SOS team take a trip back in time, finding out what it was really like to work in a mid-’80s home studio. Sample your own instruments in Sonar. Efficient management of Cubase’s Workspaces can be a great help when you need to work quickly. One of the most misunderstood subjects in pro audio is control–room nearfield monitoring: the dos and don’ts, the problems and suggested remedies. We investigate the creative potential of Mid-Sides processing in Live. Studio One offers all the tools you need to derive endless variations from a simple loop. Where does a young mix engineer learn the techniques to deliver hit rock mixes? In Dan Lancaster’s case, right here! New album Electronica sees Jean–Michel Jarre making connections with a galaxy of other legendary figures from the world of electronic music. This month we review releases from Kelly & Woolley, The SOS Team and Subliminal Message. SOS Reviews Editor Chris Korff tackles the 80s! 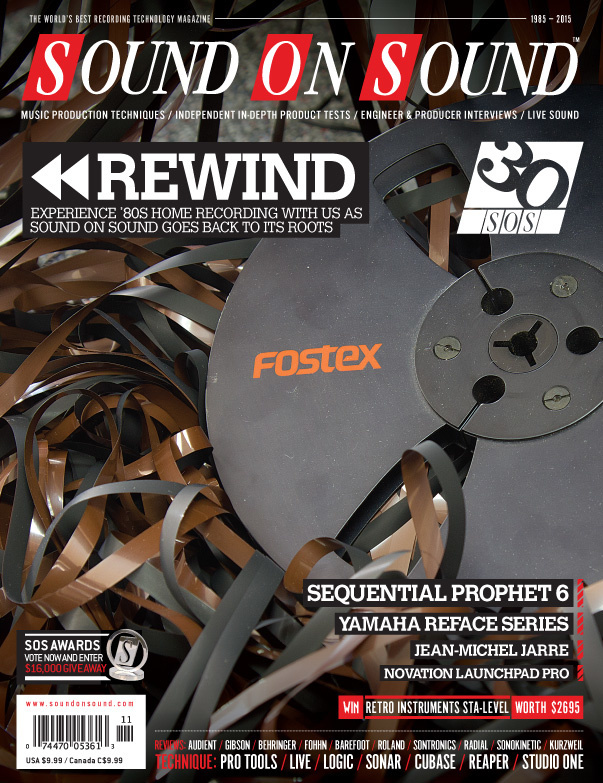 We asked dozens of professional mixers, producers, designers and audio engineers to tell us what Sound On Sound magazine means to them. TV composers won’t change the world — but the fact that we’re needed at all can be significant. As studios have had to adapt to new business models, so have the people who design them. Media content for the November 2015 issue.